Druids have long been an afterthought in RPGs, relegated to the sidelines of adventure as harmless hermits or tree-hugging environmentalists. NO LONGER! Though little noticed, evil alignments have been open to druids since the dawn of 3rd Edition, and in a wilderness-based campaign they make magnificent and malevolent menaces. This product discusses the role of druids as villains and introduces the concept of the Umbral Wood, a transplanar wilderness that reaches across the Shadow Plane, the Fey Realms, and into the Material Plane. Deep in the heart of this blackest forest lies the realm of the Midnight Master, a debauched and debased deity that embodies every awful possibility that might darken the heart of a corrupted warden of the wilderness. What follows is a collection of archetypes and druid spells. With over 30 new rules elements, Legendary Villains: Dark Druids (5E) offers a bevy of options for making your 5th Edition druids dangerous and deadly! 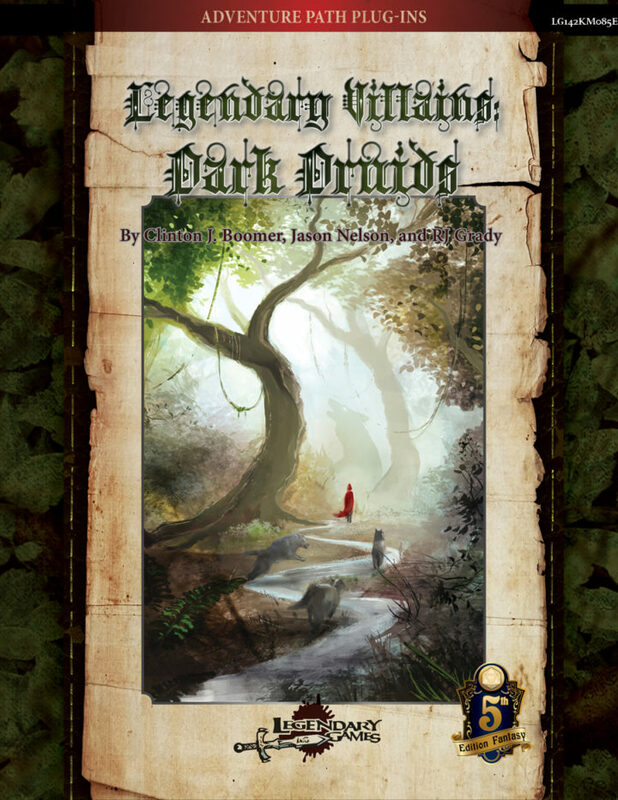 Legendary Villains: Dark Druids is the latest in our line of 5th Edition projects focused on wilderness exploration and the magic, mystery, and menace of the woodland realms. You can check out the full Forest Kingdom line right here, where you can pick up dozens of marvelous magic items in the Treasury of the Kingdom and magnificent monsters in Beasts of Legend: Coldwood Codex and amazing arboreal adversaries in Beasts of Legend: Boreal Bestiary. You'll also find an array of ardent adventurers to oppose them and serve as allies or rivals for your heroes (or even characters you can use yourself) in Conquering Heroes, plus terrific adventures like Cold Mountain and Horns of the Hunted, plus fantastic fey supplements like Faerie Mysteries, Faerie Passions, and the upcoming Faerie Bargains, all for 5th Edition! We hope you enjoy using this 26-page supplement on evil druids as much as we enjoyed making it, and that you’ll keep coming back again and again to Make Your Game Legendary!